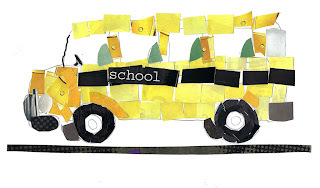 I hate to talk about the end of summer already but I must face the facts -- August is here, the back-to-school sales are in full swing and (*sniff*) my daughter will soon start attending school full-time next month. Fortunately, she is super excited and seems ready for all the new experiences ahead. Yet even though she attended school twice weekly last year, she's still a little nervous about that first day. There are so many things are running through her mind right now. Will she like her teacher? Will she meet some nice friends? Will she remember her school bus number? Will she miss home? It is my job as a parent to make sure she is prepared, feels at ease, and is ready to go back to school. 1. Shop for supplies together - We've reviewed the school supply list from my daughter's school and we've been hitting all the sales together, buying the needed items one at a time as they go on sale. My daughter likes putting all her supplies in her backpack and crossing all the items off on the list. 2. Plan the first day of school outfit - I always loved having a special outfit for the first day of school and plan to continue the tradition with my kids. 3. Learn teacher's name / meet classmate(s) - This year my daughter's teacher's name is fairly difficult to pronounce so we've been practicing it. My daughter was worried she wasn't going to know anyone in her class, so I asked around and discovered that she is already friends with at least one girl in her class. She feels a lot better about going to school because she knows she'll see a familiar face. 4. Make sure all vaccinations are up-to-date - My daughter missed her last yearly check-up because she was ill. This summer I scheduled a special appointment so she can get the necessary shots required for her age. 5. Revisit concepts learned last year in school - Even though my daughter is constantly learning from our daily activities, I'm still planning to sit down with her a few times before school and quickly revisit the core concepts from last year. This will give her confidence as she begins school and help get into the school mind set. 6. Remind about safety - A short discussion about strangers is always a good idea. Also, we'll once again review important things to remember like our phone number and address. 7. Organize and start routines - Since I stay at home, our schedule is fairly relaxed. A couple weeks before school, we plan to start with earlier bedtimes so that when the time comes my daughter will be getting enough sleep to cope with long school days. Also, an organized home helps alleviate stress. It's important to establish good habits and make sure to put everything back in its proper place. We want to avoid those mad dashes in the mornings! 8. Make the most of the remaining summer days and approach school with a positive attitude - We're planning to go on a few more family trips and spend as much spend together as possible. Hopefully our fun summer will lead to an equally fun school year! Thanks for the lists! I'll have to stop at B&N and check some of these out. I've been avoiding thinking about it - E will be in school ALL day! we don't start until after Labor Day, though, so I still have some time. This is a great list! I'll have to keep these tips in mind for when my daughter start's kindergarten next year. Great suggestions! I am busy getting ready for my first year in a virtual school setting and I will be back to look these over more closely. I wanted to let you know I recommended your blog on my own blog this week. Hope others take the time to visit.